Melinda’s is famous for its all-natural balance of heat and flavor. 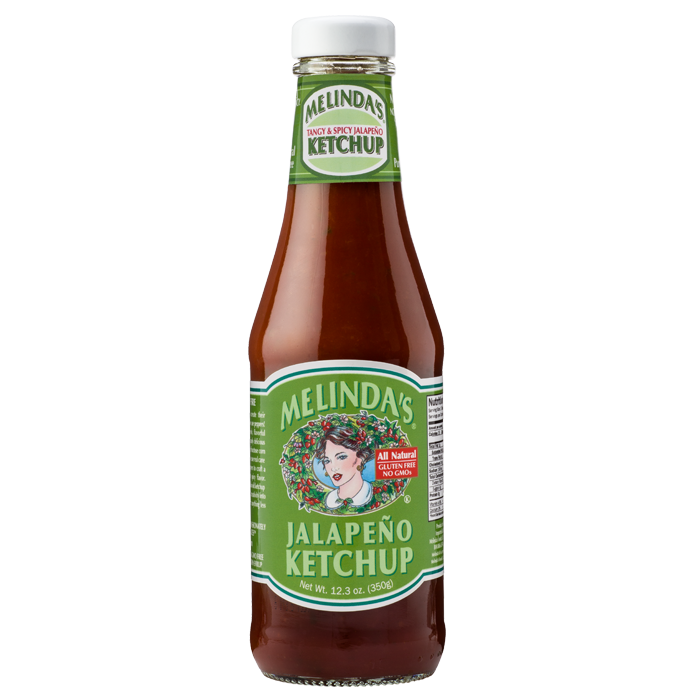 Melinda’s Jalapeño Ketchup continues this tradition by using only the freshest all naturalingredients blended perfectly with thetangy jalapeño pepper. The result is a spicy and tangy Ketchup with a bold flavor. One try and you’ll never use plain old ketchup again. Tomato Paste, pure cane sugar, glucose, jalapeño peppers, salt, starch, vinegar, garlic pulp, citric acid, onion powder, ascorbic acid, spices. Serving size: 1 Tbsp (14g), Servings Per Container: About 27, Amount per serving: Calories 15, Calories from Fat 0, Total Fat 1g (0% DV), Saturated Fat 0g (0% DV), Trans Fat 0g (0% DV), Cholesterol 0g (0% DV), Sodium 190mg (8% DV), Total Carbohydrate 4g (1% DV), Dietary Fiber 0g (0% DV) Sugars 0g, Protein 0g, Vitamin A 6% Vitamin B 0%, Calcium 0%, Iron 0%.